Marissa’s Scheduled Procrastination: Friday Fun Fact! 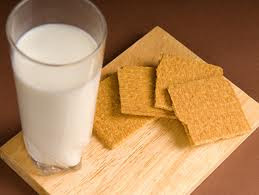 Graham Crackers were in invented in 1829 by Reverend Sylvester Graham, who felt the bland food was a perfect prescription for those prone to excessive amounts of “self-abuse.” The term used for masturbation. Apparently dry crackers would bore the sexual appetite right out of you.